I weighed in this morning at 159.2...for those of you who are counting that is over 17 lbs since May! It feels good to finally get out of the 160s! 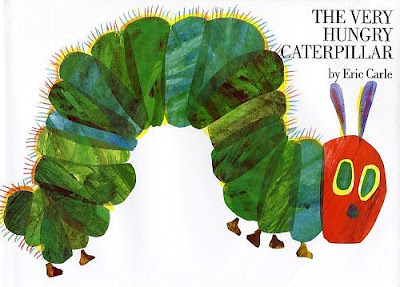 While I was reading The Very Hungry Caterpillar to Jackson last night, I realized I have the same exact eating pattern as the caterpillar in the book! I eat wonderful all week, and often times I am still hungry, as the catipillar is. By the time Saturday gets here, I eat a bunch of junk and don't feel too good about it by the end of the day. So, to make up for the bad eating on Saturday, I eat a bunch of leaves on Sunday. The only thing different from me and this caterpillar character is that I don't turn into a beautiful butterfly. Sigh. Perhaps someday! On Saturday, I organized my closet. In the process, I found the pants that I bought 6 or 7 weeks after I had Jackson. I was probably around 185 then. I'm not sure why I don't count my weight loss from there. I think I will! So, back to the pants...they are absolutely HUGE on me! I asked Troy to take a picture (above), and I felt like I was in one of those weight loss ads! That was very encouraging! By the way, I weighed myself on Friday, and I came in at 160.8 pounds. This means that since starting Weight Watchers in May, I have lost 16 lbs and about 25 lbs total! No wonder those pants are big on me! So, it seems this Weight Watchers Core diet is working for me. I weighed in this morning at 162.6 lbs. This means I have lost a total of 14lbs! It may not sound like much, but on my 5'2" frame, it is a good amount! My clothes are too big and some of my clothes that were too small now fit me, like one of my favorite jean jackets...just in time for the Fall! Well, I am excited! I walked for the first time after my surgery. I'm feeling pretty good, so I'm slowly getting back into the swing of things. I am hoping to make my goal weight of 135 by mid-December. It is going slower than I thought...but it seems I have kicked it up a notch with this other diet. And, now that my hernia is repaired, I hope I can just move forward from here!